During my seminary years (1972-1975) I was assigned this book as the text for a class on the Kingdom. I think this one book did more for my understanding of the New Testament, especially the Gospels, than any other book I read during those years. That class on the kingdom was taught by Dr. Rolland McCune who had been a student of McClain’s at Grace Theological Seminary. I used this book as a text myself when teaching in Bible College and have continued to recommend it to anyone looking for a definitive word on the subject of the kingdom. I have recently reread the book and was blessed and encouraged to report on it again. Alva J. McClain (1888-1968) was the son of Walter Scott McClain who was part of the old division in the Brethren movement (1882) that formed the Brethren Church. Alva McClain was later part of another split in that movement (1939) which formed the Grace Brethren. McClain and Herman Hoyt had already organized Grace Theological Seminary in 1937 and McClain served as its first president and professor of Christian Theology until his retirement. He received a Th.M degree from Xenia Theological Seminary and honorary doctorates from the Bible Institute of Los Angeles (where he taught for a while) and Bob Jones University. McClain wrote a commentary on Daniel in 1940 and published this volume in 1957. 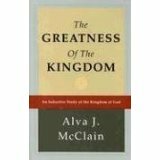 McClain’s proposition is that the kingdom of God and its King are the theme of Scripture. Although acknowledging the truth of a universal kingdom of God which God rules from heaven (thought rarely mentioned in Scripture), McClain championed the idea that the kingdom spoken of in almost every other passage of Scripture refers to a literal earthly kingdom, either the Old Testament kingdom of Israel, the kingdom of God offered to Israel in the gospels, or the future kingdom of God spoken of throughout the remainder of the New Testament. If one would consider this idea of the kingdom first when it is mentioned in these texts, the whole picture of the Bible would become clearer. For McClain, this also solidified his belief in premillennial dispensationalism which it will also do for almost anyone reading the Bible with this straightforward, literal hermeneutic.